Crows — An Australian Export? Posted on May 4, 2012 by Corvid GyrlLeave a comment on Crows — An Australian Export? I read an intriguing article about crows (and corvidae in general) and how they originated in an Australian part of Gondwana ((In paleogeography, Gondwana ( /ɡɒndˈwɑːnə/), originally Gondwanaland, was the southernmost of two supercontinents (the other being Laurasia) that later became parts of the Pangaea supercontinent. It existed from approximately 510 to 180 million years ago (Mya).)) ((Wikipedia)), something I did not know. How very interesting! I learn something new every day! This article is worth reading but I won’t re-post it here, I will link it instead. Just visit here to read the original article by Stephen Debus. Did you also know that Crows were most likely in the United States long before people? ((In the Company of Crows And Ravens By John M. Marzluff, Tony Angell, Paul R. Ehrlich)) So, think of that next time you feel they are being pests and invading your land. Perhaps, the more likely story is you are invading theirs. It is a good idea to share and share alike with crows and humans alike. How much corn can they really eat? Plants a few extra stalk for them. Posted on June 1, 2010 by Corvid GyrlLeave a comment on Crazy Attack Crows? Crows nest with 2 young and one egg. If a crow seems angered by your presence, swooping at you or cawwing aggressively, it is most likely NOT just some crazy crow. 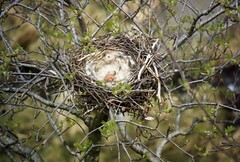 It is probably a parent protecting its eggs and nest. It is easy to dismiss why a crow might be getting loud and obnoxious, disregarding the obvious—crows have a life too. What mother wouldn’t accost a stranger who walks into their baby’s nursery? That is exactly what we are doing when we walk by a tree. They have no walls, they have no privacy, but they have a lot of love and a strong instinct to protect their young.